I was slightly skeptical at first site of this item, since it is made mostly of heavy duty plastic, and the heating element is located under its lid. This means that all its heat and cooking power comes only from the top. Once I have checked out the recipe booklet included with the oven, I decided to give it a try, and test some of these recipes to share my opinion with you. So far, I am quite impressed by this oven, so in the next few posts I will share pictures and recipes of the dishes I prepared. 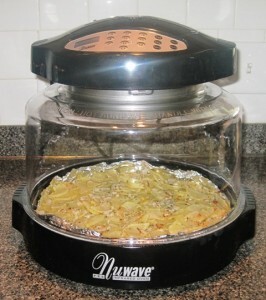 Since my kitchen has only one oven, it find it very convenient to use this Newave oven to prepare side dishes, or quick desserts. It is also very useful for cooking for TWO, or even four, with less heat in the kitchen, and less energy. It is also easy to clean, since all the parts are removable and dishwasher safe, with the exception of the lid which houses the heating element. I would like to hear from those of you who have tried this cooking gadget, and would like to share their opinion.